Oh Fudge, It’s Opening Night! 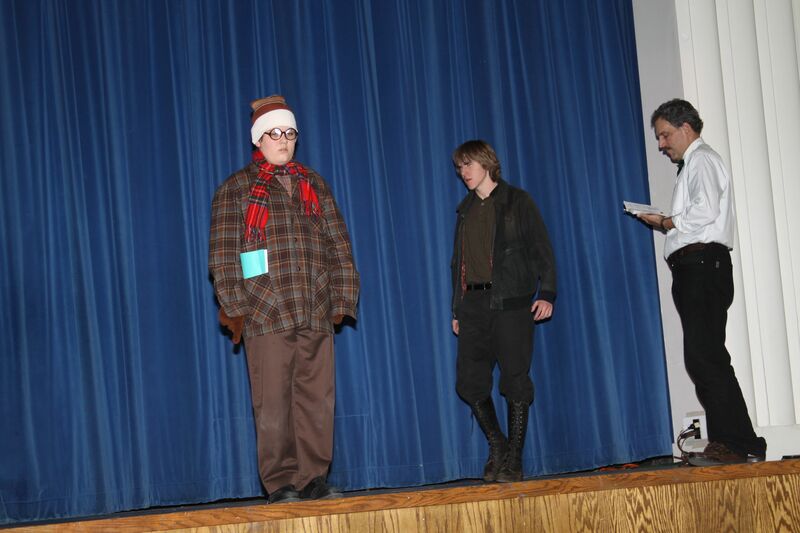 ECT’s production of Gene Shepherd’s A Christmas Story is finally ready to go and tonight’s the night! Performances are 7 o’clock tonight along with 2 o’clock matinees on Saturday and Sunday. There’s no show Saturday night so you can attend the Evansville High School’s Big Band Bash! 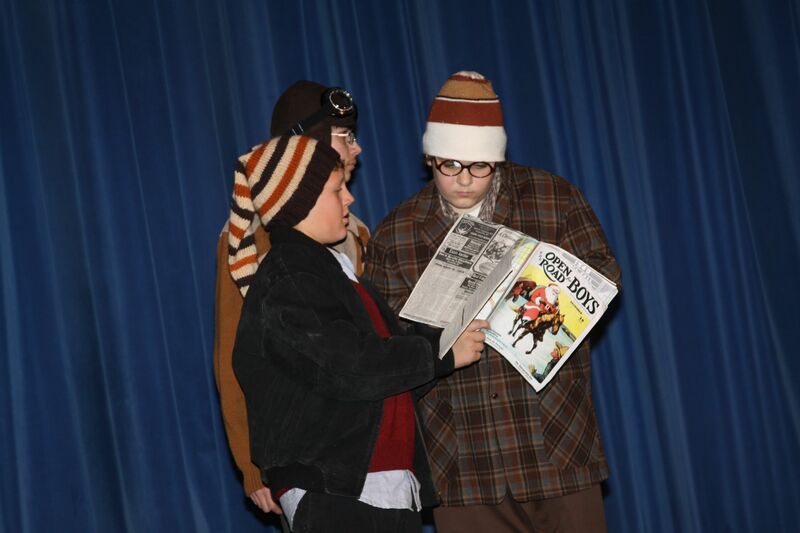 A Christmas Story returns next weekend with a show Friday night and two shows on Saturday. So come see Ralphie on his quest for that Red Ryder bb gun, the Old Man’s major award, the rise and fall of Scut Farkas and if Flick sticks to the lampost! Tickets for A Christmas Story are available online at ectstagelights.org or at the Evansville Piggly Wiggly, Bank of Evansville, or the Evansville Pharmacy. Tickets are $8 for adults or $5 for students. A bb gun is a very good thing to have. Watch out, it's Scut Farkas! 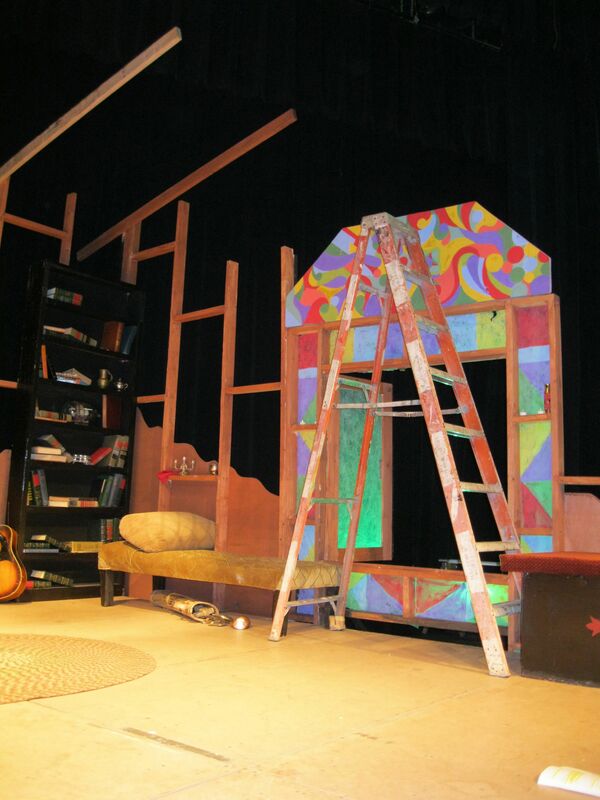 On stage, the set crew is still painting and decorating. Last Friday the light crew was working on recording cues and the sound crew was working on the sound effects. The pirates need to have their hair braided by Wednesday. Costumes, makeup, props, it all has to come together this week. It’s amazing what goes into it. And in this case, it’s amazing how the kids juggle their schedules and make the commitment. Last week marked the end of the quarter and they all had finals on Thursday and Friday. The kids had to juggle the rehearsal schedule and their studies as well as any other commitments. And now this week, long nights at the theater will be the norm as the production hits the home stretch. 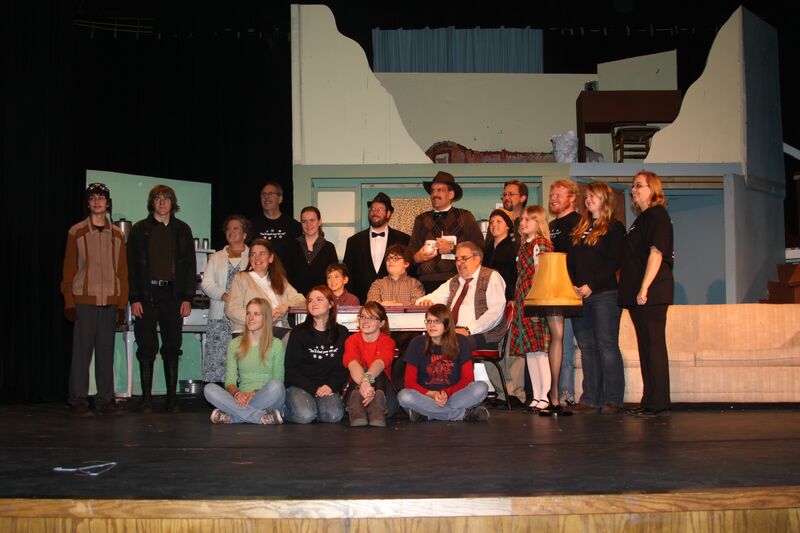 The play opens Friday and runs for four shows this weekend. In order to give more kids a chance to participate, Melissa, the Director, decided to have two casts. Producing a play with one cast is crazy enough! The first cast will perform Friday evening and Saturday afternoon, and the second will take the stage Saturday evening and Sunday afternoon. Then, just like that, the stage will be struck and work will begin on the winter student production. Where's all this stuff go? chairs, along with the couch are all in their place, all of which help give the actors a sense of space and reference points for the blocking. It all seemed to go smoothly. This week however co-stage managers Justine and Andy were there working on the back stage necessities. I suspect that most people who come to watch live theatre have some concept that the actors rely on cues–the lines of the other actors–to know when to deliver their next line, or when to start moving to a different location, or even when to appear on stage. 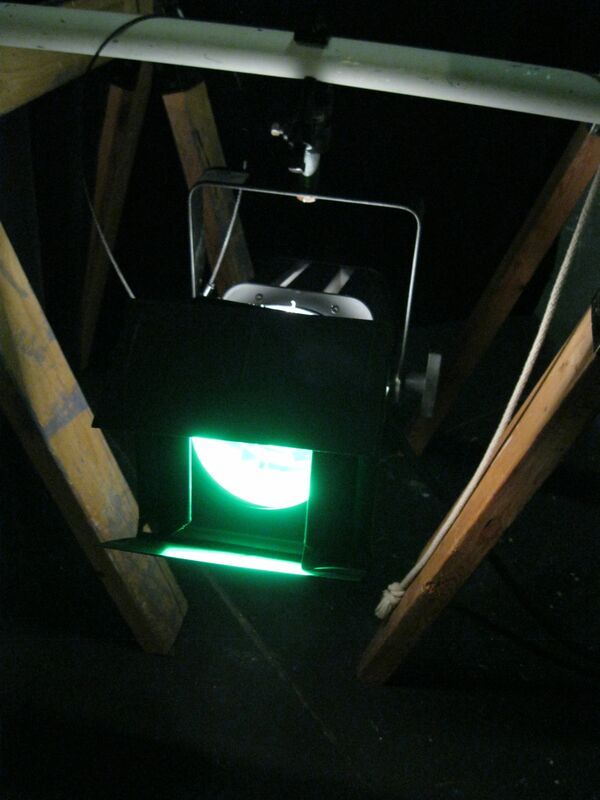 The back stage crew, as well as the sound and light crews, too rely on cues to let them know when to take action. So when the tech crew shows up and begins work it requires patience on the parts of the actors. “Does this scene happen with the curtain closed? Can we bring the car and the Christmas trees out and then have Ralph move the trees over there? Maybe we should do the school scene with the curtain half open. That’s going to be a quick costume change! Did we cut that part?” All of this slows the actors down and breaks their timing.The actors end up standing around waiting for the inevitable discussions that ensue. Once the decisions are made and the scripts are marked the actors resume, maybe for a whole scene, maybe only for a line or two. And then there is the mysterious flow of scripts. As of this week the actors are supposed to have their lines memorized and be off book. In theory, their scripts should be gone. Members of the stage crew, however, always have theirs in hand along with a pencil somewhere on their person. The cues that come out of all the discussions must be recorded in pencil as all are subject to change tomorrow. And even though the progress on stage moves in fits and starts, there is also the feeling that we are rushing headlong toward opening night. Scene changes of a different sort.